A Man of Order: On August 19, 2005, I stepped foot into St. Mary & St. Antonios Coptic Orthodox Church church for my first time. It was during a revival service in August. The Church was shaking from the voices of the people offering up praise to God. As the night came to a close, everyone sat down and filed out of the church quietly. I remember the night left such a deep impression on me (and every time I walked into that Church since) that my experience of Church has completed transformed. Church is a sacred place. It’s God’s house, a house of prayer, where the saints and angels dwell. This was one of his unwavering messages. Maintaining order in the sanctuary was of utmost importance for him. A Man of Strength: Little did I know that 9 days later (on August 28, 2005) I would be meeting Abouna (colloquial Arabic for “father”) Hanna for the first time. The night before Abouna Antonios called my wife and me; he indicated that he and Abouna Hanna wanted to meet us the following day to discuss their desire of possibly having me ordained as a priest with them. I remember sitting with Abouna Hanna and feeling overwhelmed by the strength of this man. At the end of the conversation, I told him, “Mora and I need to pray and fast about it, as it is not something we have ever considered.” His response was telling of the strength of his faith; “Ok, but I have already fasted and prayed about it” (as if to say, this thing is done). The sense of confidence in God that he portrayed was exemplary of a strength we should all strive towards. A Man of Humility: One of the greatest and most important lessons I learned from him was on April 23, 2006. That was my first Easter in Queens. The night before I had a bit of a heated exchange with one of the youth named Mina. Knowing all about it, Abouna Hanna did not say a word until the next morning. When I came downstairs for breakfast, he said “Let’s go!” I asked him where we were going and he responded “Long Island.” It was a long and quiet 45 minute drive to the Mina’s house. 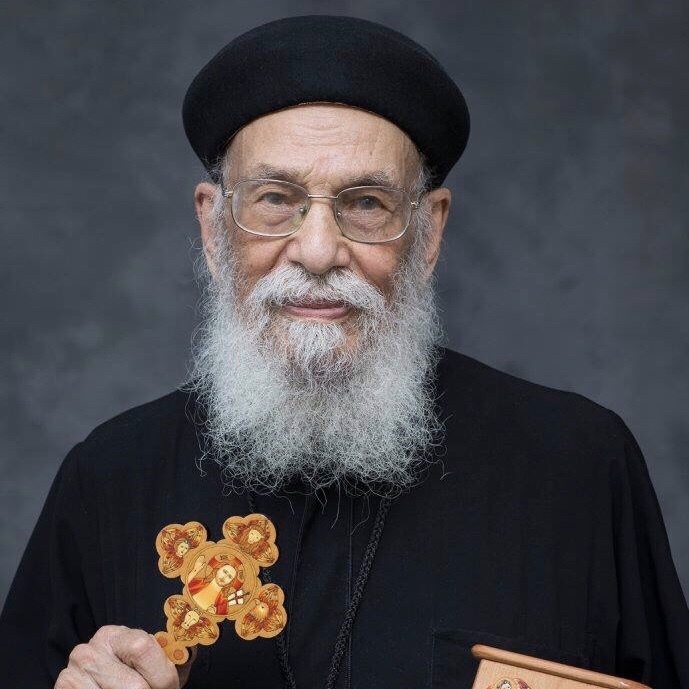 As soon as we arrived, Father Hanna jumped out of the car, ran up to the young man’s father, bowed before him (on my behalf), and he embraced the man, apologizing for what happened. Mina and I awkwardly staring at each other for what felt like 10 minutes, hugged and squashed the entire thing. We sat with the family for 5 minutes and then drove back to Abouna’s home. The drive back was equally silent with the exception of 4 words he spoke to me, “Abouna, we are servants.” He did not complain or ever bring it up again. It was not only one of the most important lessons I learned but as a result of his humility and service, Mina has become one of my closest friends. Humility is the mother of giants and humility was the mother of this giant! A Man of Prayer: There was one trait that separated him from all others. I remember during my years serving with Abouna Hanna, people often asking me if I was related to him or telling me that I reminded them of him. “I wish; that man is a spiritual giant.” He was ultra-focused on one thing. He had a one track mind; “pray without ceasing.” (1 Thessalonians 5:17) Literally thousands of people all over the world have received the 2-minute speed calls from him asking if they were praying daily and going to Church. He was laser focused on developing a life of prayer and impressing the importance of this on each person he served. A Man of Love: Perhaps his most impactful quality was his great love. The love that each person felt from him always pointed to the Father’s bosom. So many have been touched by God’s love through him and for that we are all blessed. During our first year following my ordination, Abouna Hanna and Tasoni Samia (his wife) kept their home and hearts open to Mora and me. There was a standing invitation to move in and share their home. The offer was sincere and from the heart. His offer? The basement in his house would be converted into our own apartment. Although we never acted on the offer, I came to learn that this was the way Abouna Hanna and his family lived their lives with every person that I encountered. Learn from – and imitate – him as a man of high character who ordered his life (and the church he served faithfully for 45 years) entirely around the person of Christ. On this memorial day, may – this great spiritual solider of Christ – Fr. Youhanna’s Memory be Eternal!